What is up with those DeepDream images all over the internet lately? Are they anything more than visual nonsense? 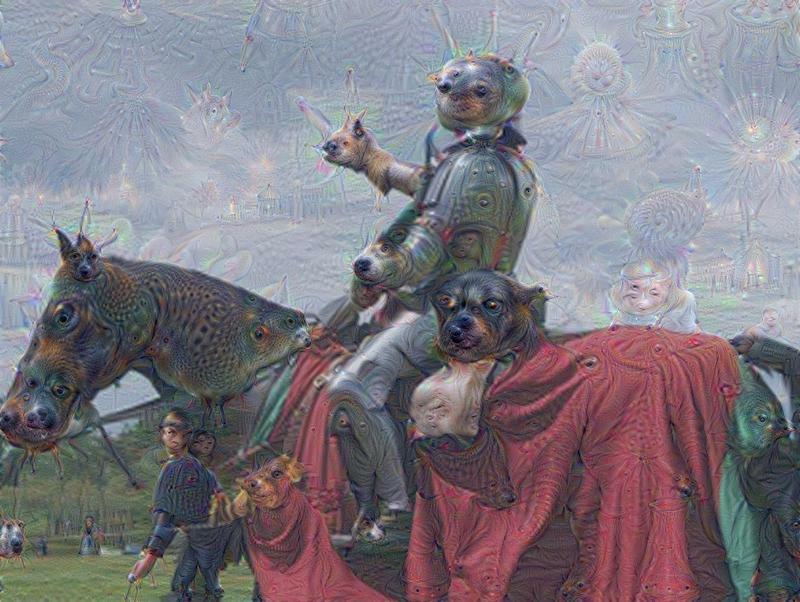 DeepDream’s knight in shining armor? I guess great minds think alike, because I started a draft of this post (when I’m on a hot streak I write a lot all at once and schedule the posts you see) and and BAM! Gordon over at Rune Soup beat me to the punch. I knew someone with an interest in magic and/or metaphysics would have to address it sooner or later.It’s too weird not to be…Weird. Call it a visual solve et coagula: The goal was to see if Artificial Neural Network (ANN) programs could be “taught” to recognize images. The program is shown repeated images of something, say, a leaf, in hopes that it will learn how to recognize the core attributes of leaf-ness and ignore irrelevant or nonessential details. Then, the ANNs were asked to draw their own versions, to see if the lesson had taken. But after all their learning, the ANNs had a lot of material with which to generate images–and what Google’s DeepDream produced are psychedelic fractal layers upon layers of dogs and eyes. The really trippy stuff comes from what the researchers call “inceptionism” after that terribly pretentious movie, where they tell an individual layer of an ANN to produce more of whatever it “sees” in the picture. Once the program has seen dogs, it sees dogs everywhere. Cyber-pareidolia. And, just as with human pareidolia, DeepDream creates arguably the most interesting images from scenes with a lot of visual noise for them to play with. I can’t help but feel that somehow this DeepDream has inadvertently stumbled upon something of metaphysical importance. Gordon calls it a haunted technology, and that just feels right. I wouldn’t put it past spirits to communicate in this way, because there seems to be enough randomness for them to work with, and enough recognizable imagery for the human mind to add its own pareidolia and make meaning. Since Google has made the code available for you to mutate your own photos, I can foresee someone using this for some kind of divination. 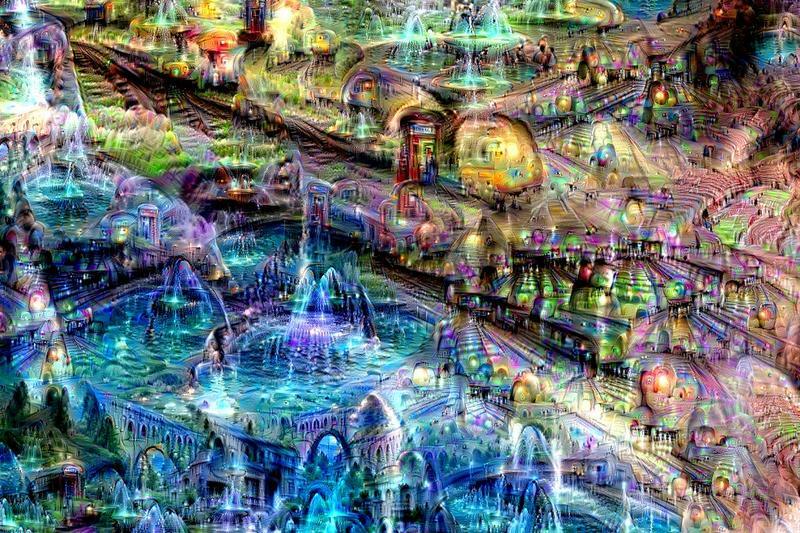 Is it mere coincidence that more than voice of experience says DeepDream’s images bear more than a passing resemblance to psychedelic/entheogenic trips? When I first saw a DeepDream landscape, I immediately thought of Pablo Amaringo‘s Ayahuasca-inspired (induced?) art. The scientific explanation says the resemblance comes from the fact that drugs disrupt our brains’ higher-level processing (such as interpreting or identifying an image–“this is a knight with a dog for a hand”), and lets the more, for lack of a better word, primitive levels go crazy with lines, shapes, and colors. Over years of practice with tarot cards, I have developed an intuitive way of reading that doesn’t necessarily rely on the “textbook” explanations. There’s a ton of information in a tarot card that you can read: the image as a whole, separate components of the image, the number, the suit, the colors used, the body language of any people or animals depicted, and you can read these elements literally or according to various types of traditional symbolism (Kabbalah, astrology, numerology, the Golden Dawn, etc.). Learning which bit of information is relevant and what it means this time comes with experience. But whoever or whatever is on the other end always seems to know which cards to use to get certain ideas across. It has been argued (for example, here) that magic works by pushing probabilities–areas with the greatest amount of built-in “give” are subject to greater magical change. There would seem to be two factors: (1) how much flexibility is in the system (and note that this includes your own expectations); and (2) how much of it can be changed through small tweaks (as opposed to major transformation). So for example, it’s easier to shift another person’s perception of your appearance than it is to alter the genetic code that determines what proteins and in what quantity and arrangement actually build your body. So it stands to reason that the same is likely true for manifestations and communications from the Other side: the more fuzzy logic, the more unpredictability, the more openness to experience, the more chaos (if you’re into that), the more both you and the Others have to play with. And therefore the question is not, does X have meaning? It is what meaning shall we make in X? Because you make the meaning, or more accurately, you co-create it. Some of your fellow co-creators are evidently capable of manipulating the space/time sensory stuff from which we assemble our little worlds. Is it that DeepDream works like a somewhat-impaired human brain to create random dogs and eyes? Or is it that both DeepDream and the brain can–sometimes, given the right circumstances–peel back the mask of “reality” and give us an analogical (analogy is key) glimpse of what lies beneath?